Brain-Work has been publishing weekly for the past four years and the blog advisory team is using this anniversary as an opportunity to review how the blog is working for you, our readers. We are looking at all aspects of the blog and everything is up for discussion – the topics we cover, the type and length of posts, publishing frequency, the name – everything! We want to hear from what you like about Brain-work, what you would like to see changed, and how the blog can support your research and professional practice. Let us know what you think in the short survey below. We will share the results on the blog and use your feedback to help guide the future of Brain-Work. Take the Brain-work reader survey now. In September the University Library at the U of S hosted the 25th Access Library Technology Conference. The core planning team (Jaclyn McLean, Craig Harkema, and myself) are still wrapping up the last loose ends and paying the last of the bills before we hand everything over to the next planning committee, but we have had time to reflect on the last year of planning and what made the event a success. The TL:DR is that smart delegating and asking for help saved our sanity and made Access a much better conference than we could have done on our own. The longevity of the Access conference is remarkable – it is not led by an academic association and doesn’t have much of a formalized structure. It is supported by a community of library technology people dispersed across Canada who pass the organizing role from institution to institution each year. It had been 19 years since Access was last hosted in Saskatchewan (Access 1998!) and it felt like we were overdue for a return to the prairies. Organizing a conference is one of those tasks that academics take on because someone has to do it, but it isn’t something library school prepares you for. In some ways, this makes Access a great conference to host, in other ways the lack of guidelines was daunting. There are so many ways to mess it up. We were handed the keys to the conference – logins credentials, a comfortable budget (that we didn’t want to empty for future years), and documentation from previous years – and were told to start planning immediately. There are only a few traditions we were advised to continue: we should livestream the conference for free (which we did – recordings on the YouTube channel), keep it a single stream program, continue the Dave Binkley Memorial lecture, and make sure there are enough socializing opportunities (and enough refreshments). Our core team was well balanced and it was a real pleasure working with Craig and Jaclyn, but we were appropriately intimidated by the amount of work that needed to be done in less than a year. In response, we delegated like crazy. This may be the most successful thing we did during the entire process. By dividing up tasks into discrete projects with well-defined time commitments and expectations we were able to approach colleagues and Access community members to pitch-in in ways that utilized their strengths and were (hopefully) professionally beneficial for them. Making targeted asks rather than a general call for volunteers also may have helped us solicit time from very talented and busy colleagues. The program committee (Charlene Sorensen, DeDe Dawson, Karim Tharani) who wrote and advertised the call for papers, coordinated the peer reviewers, and created the timetable. This felt like a gargantuan task, perhaps the biggest part of making the conference successful, and having this work happen smoothly while we dealt with more prosaic tasks was a big help. Peer reviewers, mainly members of the Access community, who volunteered online to review proposals. We were impressed with the number of volunteers and their thoughtful feedback. The diversity scholarship committee (Maha Kumaran, Naz Torabi, Ying Liu, Ray Fernandes). I could not be prouder of how well the diversity scholarship program worked this year. We were fortunate to have Maha, whose research involves diversity in libraries, agree to lead this committee who designed the application and adjudication process, spread the call for applicants well beyond the typical Access circles, and made their decision after reading many qualified applications. The excellent work of this committee made me feel confident in our process of awarding the scholarships and it is one of the top things I will recommend to future organizers. Hackfest workshop leaders (Darryl Friesen, John Yobb, Curt Campbell, Donald Johnson, Andrew Nagy) who organized workshops on the first day of the conference including hauling gear and coordinating their groups of registrants. Conveners (Megan Kennedy, Tim Hutchinson, Carolyn Doi, Danielle Bitz, Joel Salt) who coordinated, introduced, and moderated questions for each block of speakers. Social events (Sarah Rutley) who managed to transform all of our crazy (and sometimes terrible) ideas into three days of great activities, coordinating multiple vendors, food allergies, and last minute changes. Hotel logistics (Jen Murray) who was the central contact point between the committee and our venue – having one person focused on all the details around the space, food, and time schedules was a lifesaver, particularly when things went off the rails. In other areas, we ponied up and paid for professional services including the venue, catering, AV support, live streaming, and registration system. All money well spent. The downside is that I know we had enthusiastic, talented members of our local library community who would have gladly volunteered and done a fantastic job. It’s almost a shame we didn’t have more work to do. Almost. There are many more people who made this event successful including the support of the U of S Library and Dean Melissa Just, Virginia Wilson who gave us great advice based on her experience hosting the EBLIP7 conference, Carolyn Pytlyk who helped me write our SSHRC Connections grant, past Access organizers, and all of our sponsors. I also want to thank all of the attendees who were so engaged and enthusiastic about both the perogies and the conference program. The whole process was so much fun you can count me in to host again in 19 years – see you at Access 2036. 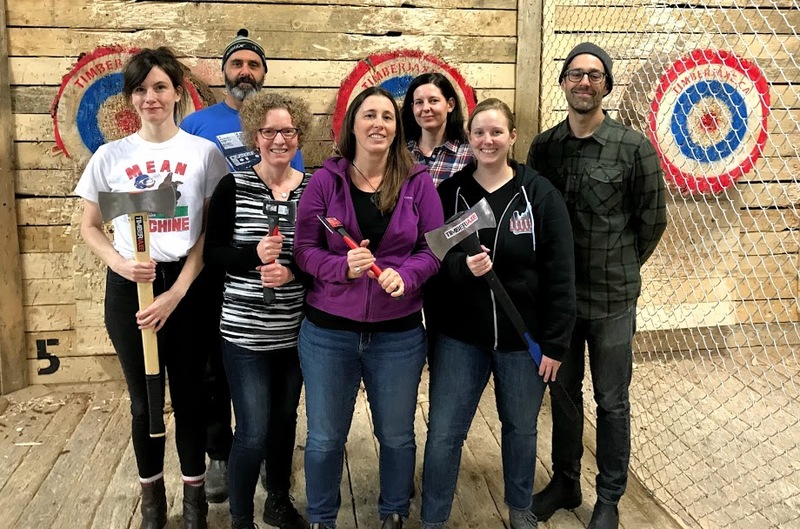 Access 2017 organizers and volunteers celebrating a successful conference by throwing axes. Through the course of my day-to-day duties, I came across an interesting article by Adams et al. about searching for “grey information” for the purposes of evidence synthesis in public health. For anyone who is unfamiliar with evidence synthesis, evidence synthesis is much more than a literature review. It involves identifying and tracking down all relevant evidence, evaluating it, extracting data, contacting authors to request additional data that is not included in a published article (where applicable), and using that larger pool of data to answer the question at hand. A thorough evidence synthesis includes grey literature – literature that is published by an entity that’s main business is something other than publishing – in an attempt to reduce bias. There can be some seriously heavy statistical analysis involved, and the entire process is a heck of a pile of work. Adams et al. took the idea of grey literature, extended it to other information that is difficult to get hold of, and provided a critical reflection of three separate projects where they relied heavily on “grey information”. When I read their article, I was struck by two things. First, Adams and colleagues were interested in public health programs that came out of practice, rather than formal research. As they point out, “Interventions and evaluations that were primarily conducted as part of, or to inform, practice may be particularly unlikely to be described in peer-reviewed publications or even formally documented in reports available to others in electronic or hard copy. Information on these activities may, instead, be stored in more private or informal spaces such as meeting notes, emails, or even just in people’s memories.” To me, this statement applies as much to librarianship as it does to public health. I can’t imagine how many awesome library programs and practices we could learn from, except for the fact that few of us have heard about them. The second thing that struck me as I read this article was that even though the authors conceded that their work was “verging” on primary research, they considered these projects to be evidence syntheses instead. But evidence synthesis relies on published information. Rather than ask for additional information to clarify the data they collected from a published source, the authors gathered new information by interviewing key informants, so to me, they were conducting primary research: full stop. The authors seemed to know what an evidence synthesis actually entails – not everyone can say the same – so I wonder: the work they did was a legitimate form of research so why would they label it as evidence synthesis? Are the lines between different forms of research really that blurry? Were they trying to avoid going through the REB process? Or were they concerned their work wouldn’t have the status associated with an evidence synthesis and so they named it to their liking? I think that sometimes we don’t realize that library research has a lot in common with research in other fields. Like the field of public health, there is so much useful information about our practice that is not widely available or findable. I think we also have our go-to research methods, and opinions about what kinds of publications count… and what don’t. The “how we done it good” articles that simply describe a program or activity have gotten a bit of a bad rap in recent memory. I do agree with those who say that we need more rigorous, research-oriented library publications in general. But simply sharing what was done informs us of what is going on in library practice in a discoverable way. Perhaps we should not be so quick to discourage it. Adams J et al. Searching and synthesising ‘grey literature’ and ‘grey information’ in public health: critical reflections on three case studies. Systematic Reviews. 2016;5(1):164. In The End, It All Starts With Really Good Questions! While attending an experiential learning showcase on my campus a few weeks ago, I was struck by a common theme mentioned by several faculty presenters. Faculty who work with students undertaking original research projects noted that a common challenge for students was identifying a research question. A particular faculty member surveyed her students on their experiences with the course research project and students reported that articulating a research question was the most difficult part of the entire research project. An interesting side note is that students reported that analyzing their data was the most valuable part of the process. The challenge of formulating research questions piqued my interest as a librarian as we are often on the front lines assisting students with the evolution of their topic as the research process unfolds. We often help students navigate the iterative processes of exploring a topic, brainstorming potential avenues of research, asking different questions, undertaking initial searches in the literature, narrowing the scope of a question or alternatively broadening the scope, all the while tweaking the research question and trying to avoid the dreaded ‘maybe I should just switch my topic’. I often wonder if there is an understanding of the time commitment and perseverance required for these initial, complex processes in the research cycle. Clearly, students are struggling with this, as shown above; this challenge was echoed in Project Information Literacy’s findings where they asked students what was most difficult about research; 84% reported that getting started was the most challenging (Project Information Literacy, n.d.). We know that students struggle with these initial stages of the research process, so what can librarians and faculty do to help students get past the hurdle of formulating good research questions? Here are a few suggestions. Be explicit about the process. Research is iterative, messy, and time-consuming and often students who are new to academic research may arrive with a more linear mental model of the research process. To illustrate that research is a process, it is powerful to show students how to take broad course-related research topics, break them down into potential research questions, discuss how the questions evolve once one gets a taste of the literature and how further refinement of the question takes place as the process continues. By being explicit about the process, students have a better understanding that the broad topic they start with often evolves into something much more meaningful, unexpected, or interesting. Encourage curiosity in the research process. At the campus event I alluded to, when I asked faculty how they dealt with students’ struggles with identifying research questions, they all reported the importance of students picking something that interests them, something they are curious about. Anne-Marie Deitering and Hannah Gascho Rempel (2017), librarians at Oregon State University, recognized the overwhelming lack of curiosity expressed by students in their study, when these students were asked to reflect on their own research process. In response, the authors recommend “that as instruction librarians we needed to enter the process earlier, at the topic selection stage, and that we needed to think more intentionally about how to create an environment that encourages curiosity” (pg 3). In their awesome paper, the authors discuss different strategies they used with first-year students to encourage curiosity-driven research. Start with a juicy source or artifact! Chat with faculty and ask them to recommend a subject-specific editorial, news article, blog posting, etc. that is controversial and/or thought provoking. These sources can be old or new; the point is that students start with intriguing sources, not a pre-determined list of research topics. Students examine the sources then begin to develop various lines of inquiry, which evolve into research questions. Step 1: Teachers Design a Question Focus. This question focus is a prompt in any form (visual, print, oral) that is meant to pique students’ interests and stimulate various questions. Step 2: Students Produce Questions. Students note questions following a set of four rules: ask as many questions as you can; do not stop to discuss, judge, or answer any of the questions; write down every question exactly as it was stated; and change any statements into questions. Step 3: Students Improve Their Questions. Students identify their questions are either open- or closed-ended and flip the questions into the alternative form. Step 4: Students Prioritize Their Questions. With the assistance of the teacher, students sort and identify their top questions. Students move from divergent thinking (brainstorming) to convergent thinking (categorizing and prioritizing). Step 5: Students and Teachers Decide on Next Steps. This stage is context specific where students and teachers discuss how they are going to use the identified questions. Step 6: Students Reflect on What They Have Learned. This final step allows for students to develop their metacognitive / reflective thinking (Rothstein & Santana, 2011). Rothstein and Santana (2011) note that “(w)hen students know how to ask their own questions, they take greater ownership of their learning, deepen comprehension, and make new connections and discoveries on their own. However, this skill is rarely, if ever, deliberately taught to students from kindergarten through high school. Typically, questions are seen as the province of teachers, who spend years figuring out how to craft questions and fine-tune them to stimulate students’ curiosity or engage them more effectively. We have found that teaching students to ask their own questions can accomplish these same goals while teaching a critical lifelong skill” (para. 3). We know that formulating research questions can be a challenge for students. Being honest, explicit and transparent about this process may help students in tackling this challenge. I think we could all agree that encouraging curiosity in research and asking meaningful questions is not something that is confined to academia but rather are characteristics seen in lifelong learners.